Martin Scorsese said it was a big influence on his films "Taxi Driver" and "Raging Bull." George Romero, director of the seminal zombie thriller "Night of the Living Dead," said it was the reason he became a filmmaker. The "it" in question is Michael Powell and Emeric Pressburger's Technicolor masterpiece "The Tales of Hoffmann," which has entranced and influenced filmmakers since its release in 1951. "Ten Commandments" director Cecil B. DeMille wrote the British filmmakers in 1952, telling Powell and Pressburger: "For the first time in my life I was treated to Grand Opera where the beauty, power and scope of the music was equally matched by the visual presentation." In their beloved 1948 Technicolor film "The Red Shoes," Powell and Pressburger presented a story of love and art set in the world of ballet. In "Tales of Hoffmann," which was shot in just 17 days, they innovatively blended ballet with opera. Except for singers Robert Rounseville, who plays Hoffmann, and Ann Ayars, who plays Antonia, the directors cast noted ballet dancers such as Moira Shearer from "The Red Shoes," Frederick Ashton (who also created most of the choreography), Robert Helpmann, Léonide Massine and Ludmilla Tchérina to bring this adaptation of Jacques Offenbach's 1881 opera to life. The dancers lip-synced to a recorded score conducted by Thomas Beecham and performed by opera singers. "They were just out there with his," said longtime Scorsese film editor Thelma Schoonmaker, who was married to Powell from 1984 until his death in 1990. "It was a gutsy decision instead of using real opera singers to use dancers because of their dramatic movements." " 'Tales of Hoffmann' was a daring and bold thing to try," said Margaret Bodde, executive director of the Film Foundation, which Scorsese began 25 years ago to preserve and restore motion pictures. "The film is like an experimental film. If you read the description of the production, you wouldn't have imagined it would have come out as well. It holds your interest in a way that you wouldn't imagine a film like this would. " 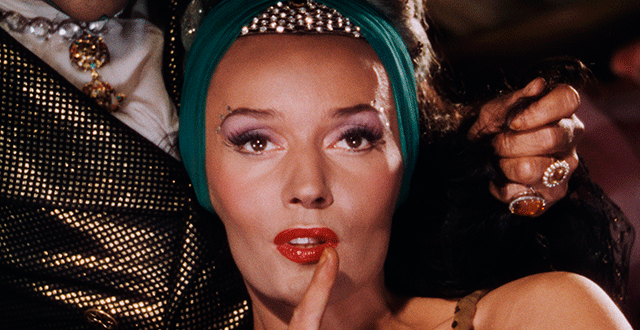 Now, 64 years after its initial release, "Tales of Hoffmann" has been digitally restored by the Film Foundation and the BFI National Archive in association with Studiocanal. Scorsese, Schoonmaker and Ned Price, vice president of mastering for Warner Bros. technical operations, supervised the restoration work, which was completed by Warner Bros. Motion Picture Imaging. This restoration, which opens Friday for a weeklong run at Cinefamily at the Silent Movie Theatre in Los Angeles, brings out all the detail in Hein Heckroth's lush production and costume design and Christopher Challis' vivid Technicolor cinematography. The new version also includes six minutes of footage that was cut before its original release, as well as an epilogue. The original 35-millimeter Technicolor three-strip nitrate camera negative and 35-millimeter original soundtrack negative from the British Film Institute vaults were used for the restoration. The material for the added footage was also discovered at BFI. Those involved with the Film Foundation Technicolor restorations of Powell-Pressburger's "The Red Shoes" and "The Life and Death of Colonel Blimp" from 1943 had to contend with mold on the original negatives. But that wasn't the case with "Tales of Hoffmann." "It was in quite good condition," Price said. "We dealt with the normal shrinkage, which is inevitable with film. Over time, they lose moisture. They shrink and they warp differently. But we aligned the three strips, and they matched perfectly." Schoonmaker, who also supervised the restoration of "Red Shoes" and "Blimp," said the team was "very lucky that we could concentrate on the color and the detail instead of having to spend a lot of money on cracks and mold and dirt." For years, fans of the film have talked about missing footage, Schoonmaker said. "Scorsese and I didn't know what that was," she said. "Finally, when we started getting all the elements together, the woman at the British Film Institute scoured the vaults and found the missing six minutes." That footage involved a dramatic and critical sequence in the third act in which Hoffmann has fallen in love with the young opera singer Antonia, who has consumption and whose conductor father has forbidden her to see Hoffmann or to sing. The film's producer Alexander Korda hated the third act, Schoonmaker said. "He wanted it cut entirely, and Michael refused," she said. "The assistant editor was in the room when this conversation took place, and she personally told me that Korda threatened Michael with ruin if he didn't drop the entire third act. So as some sort of comprise, they chopped those six minutes out, and it really ruined the third act." Everyone was surprised, though, when they saw the epilogue footage, which is a curtain call in which the dancers are paired with the opera singers who sang their parts. The sequence had no sound, so the team added music and applause over the sequence. "I said, 'We have to use it, it's so fascinating,' " Schoonmaker said. "I'm sure they wanted it in the film. It's so witty. The Film Foundation's Bodde said the epilogue is one of her favorite parts of "Tales of Hoffmann." "It lends such a note of whimsy and the creative spontaneity that you always feel in a Powell- Pressburger film," she said. Schoonmaker, who is in Taiwan working on Scorsese's new film "Silence," will appear via Skype after the 6:30 p.m. Saturday screening at the Cinefamily.